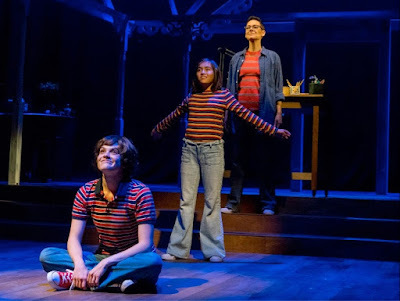 “Fun Home” with music by Jeannie Testori, book and lyrics by Lisa Kron, (“2.5 Minute Ride”, “Well”) based on the ‘graphic’ novel by Alison Bechdel is currently playing downtown at the San Diego Repertory Theatre, Lyceum Stage through Sept. 30th. 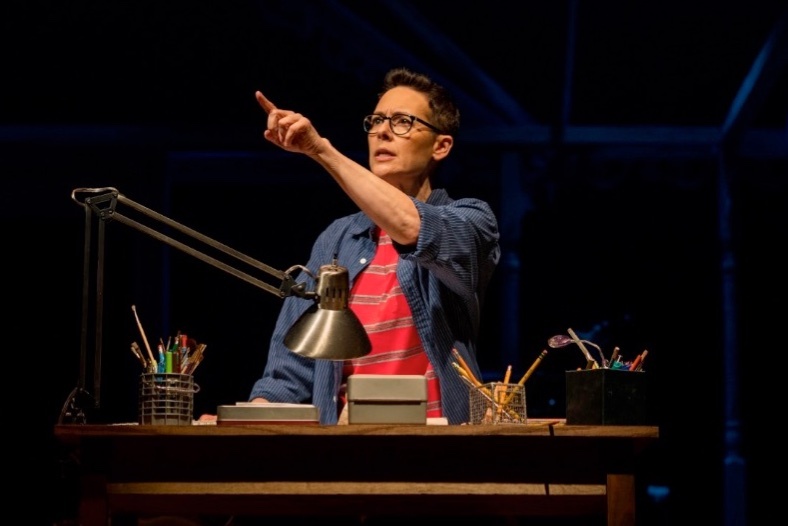 It’s a comedy, it’s a drama, it’s a musical it’s a coming of age/coming out party for Alison Bechdel, her two brothers, her father and her mother. One might not consider the comings and goings of the five Bechdel’s a party or even funny for that matter unless you were one of the family and you were a cartoonist chronicling your life in a large sketch book. No one really knows what goes on ‘behind closed doors’, not even all those living within those doors and especially those outside those doors, not unless you are privileged to walk through those doors. 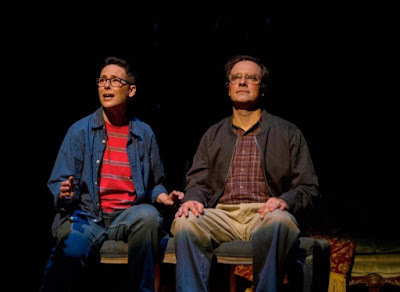 Bechdel opened those doors when her memoir “Fun Home: A Family Tragicomic” came out onto the public domain in 2006 in book form, while her 1983-2008 comic strip “Dykes To Watch Out For” was syndicated in dozens of newspapers and translated in several languages. The book was adapted as a musical by Kron and Tesori after several readings at the Ojai Playwrights Conference, then Sundance it opened on Broadway in 2013, to rave reviews. In 2015 it was nominated for 12 Tony’s including Best Musical. Now staying put in San Diego through the end of the month, it is being given a class act staging by artistic director Sam Woodhouse with local celeb Amanda Naughton, Bechdel’s alter ego, as the adult Alison the role Beth Malone (“Annie Get Your Gun”) played on Broadway. Friend and colleague Bets Malone is the put upon wife, mother, teacher and actress Helen. Two youngsters play ‘small Alison’ (Taylor Coleman and Isabella Pruter). The night I attended, Ms. Pruter played ‘Small Alison’ and Claire Adams played ‘Medium Alison’. The “Fun Home” is in fact the local communities funeral house, Bechdel Funeral Home, (“Come To The Fun Home”) run by Alison’s father Bruce (Jim Stanek) part time funeral director, who also taught high school English during the day and went gallivanting to gay bars at night. We meet Alison as she is sorting through a lone box of ‘things’ salvaged and kept throughout the years as she recalls the past, (“Ring of Keys”) picturing her Dad going through old artifacts he found in the garage while restoring the old Victorian house on Maple Ave. Looking back she reflects on her younger (“It All Comes Back”) self. While Naughton is ever present and stately, with a range of expressions and emotions on her sleeve as she looks over her shoulders reflecting on her growing up years, her father’s mood changes, her mother’s being pushed to the background never seeming happy, the fun, the pain and the angst, Claire Adams is a standout as the Medium Alison taking us trough this narrow path of what the Bechdel Family looked like. We travel with her through her freshman year in college, her father’s insistence she read, read, read and her coming out. She also meets her first love, Joan (a fun, down to earth Alexis Louise Young). It is here that she gets up the courage to come out to her family especially her father. 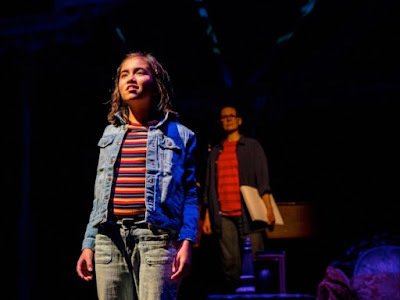 Jim Stanek’s Bruce is her happy, sad, demonstrative, demanding and moody father, who at the drop of a hat will be wooing a high school student in his office one minute, playing games with his youngsters another or walking his compulsive obsessive behavior through the house in another. He does them all very well. With strong cast in hand, and spot on direction by Woodhouse this sentimental oft time funny and all too tragic journey is framed in the outline of their Victorian home (Sean Fanning). Furniture is rolled on and of the set depicting places and David Lee Cuthbert’s pinpoint lighting and projections identify places and locations outside the home. Jennifer Brawn Gittings almost matching striped jersey’s for each of the Alison’s are a brilliant take especially in the finale when all three Alison’s (“Flying Away”) come together in unison. A seven-piece band conducted by musical director Robert Meffee is behind a scrim in back of all the action. Together with Javier Velasco’s choreography, Kron’s lyrics and Tesori’s music, “Fun Home” is a keeper. My mind wandered back to the growing up years of my own three offspring and it kept asking what they would have to say in a memoir. All three have different memories of the same events as they happened. Alison's, while heartbreaking found the high ground and the low ground through her work as an artist and a writer. Kron and Tesori put it to music and that made all the difference.